See the image linked above for a visual comparison. The sizes are listed again with the handwriting set links listed below. New sets that are not included in the illustration above will be pictured below. The first new set is the ZB set - a set of over 500 worksheets. Set 1 Rule: 1 3/4"
Sets 2 & 3 Rule: 1 3/8"
Enough worksheets for a full school year, this set is coordinated with the book, "Teach Your Child to Read in 100 Easy Lessons." The book is not required to use the handwriting lessons. 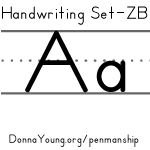 *There are 5 worksheets in each of two different letter styles. 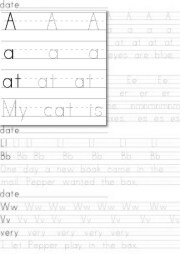 *The Small Print web site has manuscript handwriting worksheets in two different letter styles. Each style has a various number of worksheets.